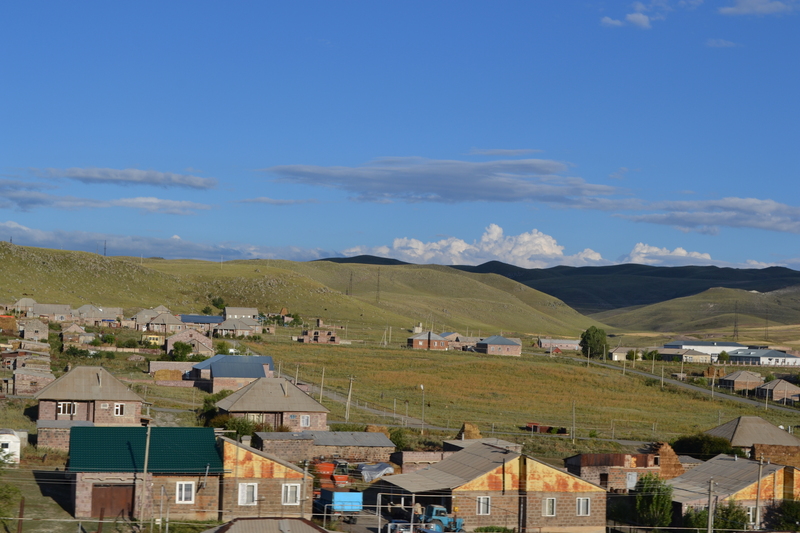 If you’ve been exploring the Armenian countryside, you probably already found yourself riding the train from Yerevan to Gyumri. Provided you’re not in a hurry to reach your destination, the 3-hour ride in itself is a mind-blowing travel experience. Sitting on the soviet-era wooden benches and enjoying the bucolic view always makes us feel like we’re time traveling. It was during one of those enjoyable train rides that the concept for In Motion popped in our minds. To us, the characteristic epoch train seemed like a perfect location for a HAYP Pop Up exhibition. We envisioned an art-takeover of one or more train carts, with contemporary artists and performers collaborating to transform the traveler’s experience. The HAYP train idea had been stirring in our minds for quite some time; we were just looking for a good opportunity to set it in motion. 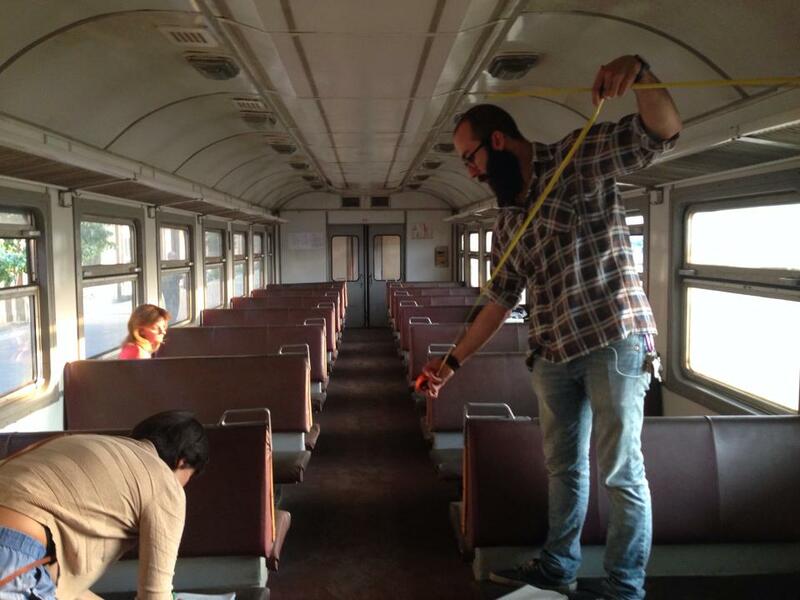 Upon learning about the “Luys i Luso” event scheduled for October 29th in Gyumri, we decided the time had finally come to takeover the train, and connect the Yerevan community to the vibrant Gyumri art scene. Many in Armenia and in the diaspora have heard of, or indeed attended, pianist Tigran Hamasyan’s world tour “Luys i Luso”. 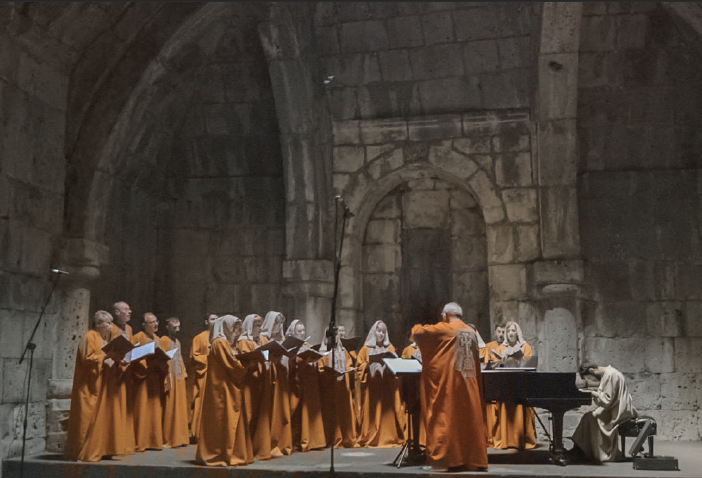 Since the beginning of 2015, Tigran Hamasyan has been performing Armenian legendary hymns with the Yerevan State Chamber Choir in 100 churches around the world, to commemorate the 100th anniversary of the Armenian genocide. Emily Mkrtichian & Alex Igidbashian recorded his performances, and teamed up with Natalia Sookias from Ondé to transform them into a series of multi-media immersive installations. These installations will include footage of Tigran Hamasyan’s concerts in Ani, Akhtamar, Musa Ler; animated images of musical manuscripts; and live music and dance performances. Natalia Sookias plays with all these elements and with the architecture of the space, to enable the audience to explore and interact with the multi-media installation. The grand premiere will take place in Gyumri, on Thursday, October 29. The innovative installation will then stay up for 3 days, until Saturday, October 31. For us at HAYP Pop Up Gallery, this event is the perfect occasion to launch In Motion, a contemporary art installation aboard the Yerevan-Gyumri train. In addition to the beautiful landscapes and the (very) endearing soviet aspect of the train, HAYP will offer a unique, interactive art experience for travelers. The opening event will take place on Thursday, October 29, and the installation will stay up for 10 days. That way, we hope to bring visitors to the “Luys i Luso” installation premiere in Gyumri… but not only! We believe that art has the power to build bridges, establish connections, and bring communities together. Throughout the 10 days of our artistic train takeover, we will therefore invite the Yerevan public (art-lovers, students, tourists… and train enthusiasts) to explore the creative scene in Gyumri. Come along for the HAYP ride! Artists – We are looking for cool installation art! Check out our Call to Artists. Friends from Gyumri – If you, or someone you know, has an event, project, or exhibit that you’d like to promote, let us know! We will hand out flyers with a “things to do in Gyumri” list and a map of their respective locations to people riding the train. If you want to be on the map, get in touch with us! Email us at info.hayp@gmail.com or get in touch with us on Facebook. HAYP train fans – Follow In Motion‘s progress on social media, and join us for the art ride! We will keep you posted on Facebook, Twitter and Instagram. Follow us / Հետեւեք մեզ!